Address: Reina Sofia, 25, Puerto del Carmen (Lanzarote), Islas Canarias. An attractive holiday resort located in a peaceful area of Puerto del Carmen, THB Flora is just 800 metres from the beach and 500 metres from the shopping centre. 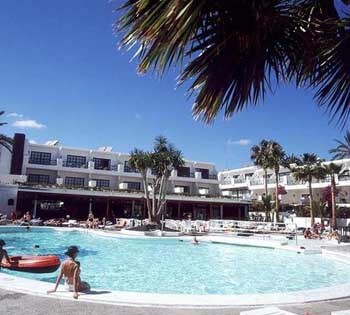 There are leafy gardens that surround the Flora Apartments Lanzarote, where you will find 2 splendid swimming pools with a terrace, bar, nursery and children’s playground. In addition, to keep you entertained, there are billiards, table-tennis, a games room, fiestas, dances and a wide entertainment programme for both adults and children making this a great option for all the family. The comfortable apartments features a balcony and a kitchenette with a microwave. Each one comes with satellite TV. Most also have sea views. The Hotel THB Flora has a bar-restaurant and a snack bar. There is also an on-site supermarket. The airport is just 10 km from the property, and Arrecife is 17 km away. Guests are required to show a photo identification and credit card upon check-in. Please note that all Special Requests are subject to availability and additional charges may apply. The hotel does not accept American Express cards as a form of guarantee or payment. Please note that guests must present the credit card used to make the reservation on arrival. Please note that the credit card holder must be present upon arrival. If you are not the owner of the credit card used to make the reservation, please contact the property in advance.